what color you paint your walls. Heating and cooling are two of the largest expenses in my hundred-year-old New England home. It should come as no surprise then that I’m a huge fan of the Nest learning thermostat. Connected home technology makes my home more comfortable at a lower cost – what’s not to like? As it turns out, the Nest is about to have some serious competition on its hands. Today, Honeywell unveiled its new Wi-Fi Smart Thermostat with Voice Control. It has features almost identical to the popular Nest, but with the power of voice activation. The thermostat uses your home’s WiFi connection to help it interpret spoken requests and learn from them. Of course, that means the voice features can’t be used when your WiFi and Internet are down. Still, you can always change the temperature manually, regardless of connectivity. Beyond these voice features, the Honeywell Smart Thermostat lets you easily change the background color of the device, so it matches your décor. You can also pair your thermostat with your smartphone, letting you control your home’s climate from as far away as the Indonesian jungle. 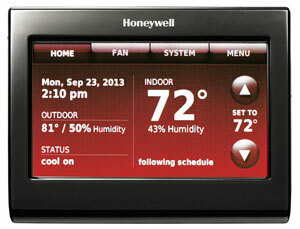 The Honeywell Wi-Fi Smart Thermostat with Voice Control will go on sale in November 2013 at most major home improvement stores. Its suggested retail price is $349.99, though rebates from your utility provider may be available. To learn more about the device, visit wifithermostat.com. Honewell doesn’t seem to get it that millions of choices and features are not really what the nest is about. Design is frequently about using as little as possible, or in this case about offering the simplest possible tool set. I gave my Honeywell thermostat to the technician who installed my nest. He was a microsoft/technocrat junky who seemed to view all things apple related as being part of some liberal agenda.For the most part my nest has done exactly what I want it to—no more, no less. if it is wifi attached Who is the talking to?and this is day and age I don’t want to have my service that hacked by some pimply faced 15 year old for the fun of it.